What would the world be like without Star Wars? You may know Star Wars caused innovations in miniatures, but how about the connection between Star Wars and Toy Story? Or Forrest Gump? 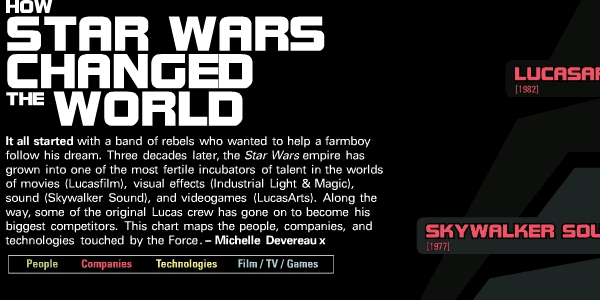 Created by Michelle Devereaux for Wired, it explores the different innovations and changes that Star Wars caused in movies, videogames, and sound. 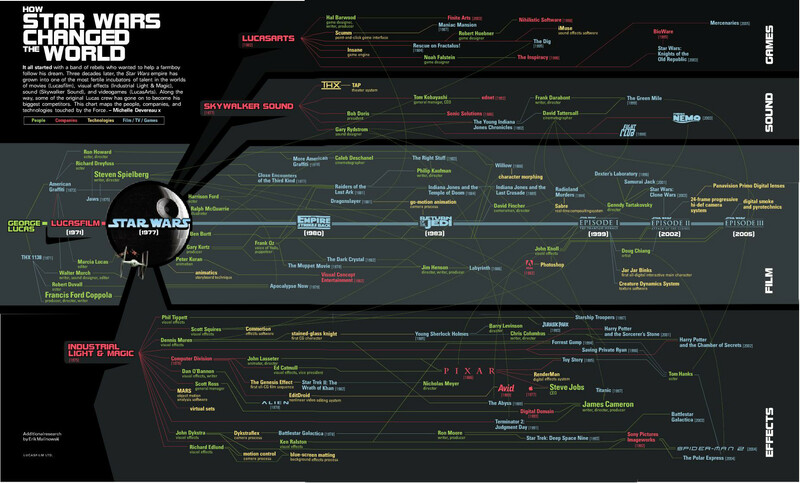 This infographic is called "How Star Wars Changed the World," but it's mostly about how it changed the entertainment industry. Even enlarged it was hard to read, but I'd think ILM had one of the biggest impacts. So many films have benefited from the company and technology. Lucas was smart to surround himself with innovative people. Especially in ILM, and letting them come up with solutions to make movie history. That is very insteresting. Agreed with Alex though, I hate the way I'm forced to look at it. It makes me actively try to not look, even though I want the information there, it's frustrating to navigate around the interactive version. Ugh.